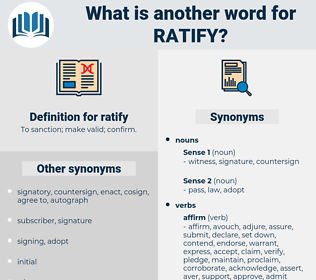 What is another word for ratify? To sanction; make valid; confirm. Authorizing, authorizes, approving, affirms, accepts, Permits, Grants, allows. 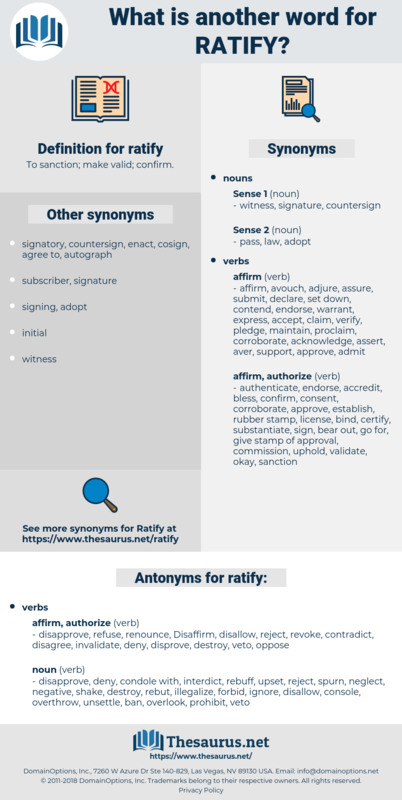 authorize, reaffirm, affirm, undertake, reconfirm, accede, sign, adopt, reiterate, authorise, accept, grant. disapprove, refuse, renounce, Disaffirm, disallow, reject, revoke, contradict, disagree, invalidate, deny, disprove, destroy, veto, oppose. decline, condole with, forbid, overthrow, weaken, shatter, negative, ignore, turn down, ban, illegalize, overlook, unsettle, rebut, enjoin, prohibit, spurn, disregard, rebuff, console, neglect, upset, shake, interdict, proscribe. I cannot believe that our colonies would refuse to ratify the arrangement that I have outlined, if they were invited to do so by our own Government, and given proper security. Maria Consuelo was the nameless orphan child of an unacknowledged marriage - of a marriage which was certainly not legal, and which the Church must hesitate to ratify. ratafee, red bay, radio wave, ride off, rate of pay, ratafia, red tape, reed pipe, rid of, rout up.